In Windows Phone 7.x users can already interact with their phone using the voice. This is done by pressing and holding the Windows key and giving the phone a voice command e.g. “Start [appname]” or “Open [appname]”. In Windows Phone 8 you can extend this and add additional phrases that a user can say which opens up new opportunities allows users to launch to a specific page in an app and launch an app and initiate an action. 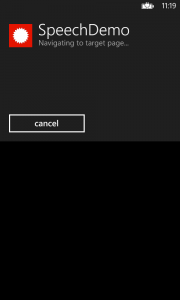 This post will cover how easy you can implement voice commands in your app. Source code is provided at the end. Note; this post covers start up commands. Speech recognition within the app will be covered in a later post. So, we start of with a new Windows Phone 8 project. The first step is to open the WMAppManifest.xml-file located in the Properties-folder. Switch to the Capabilities-tab. Here we will give the app the necessary capabilities to be able to handle the voice commands. Check the ID_CAP_SPEECH_RECOGNITION-capability. For our demo purpose, before we start with the commands, we add another page to the solution so we have something to navigate to. We can call the page Target.xaml. Now we are going to add a new item to our project. Select Add->New Item in the context menu for the project and select Voice Command Definition. Lets name it VCDFile. The VCD-file will give you an example of how to setup your commands. So lets digg into the file and make it our own. Let’s start at the top with the Command Prefix and Example. The value in the prefix tag is what the app will look for as a prefix to the command. So the user will say “SpeechDemo” followed by the commands. 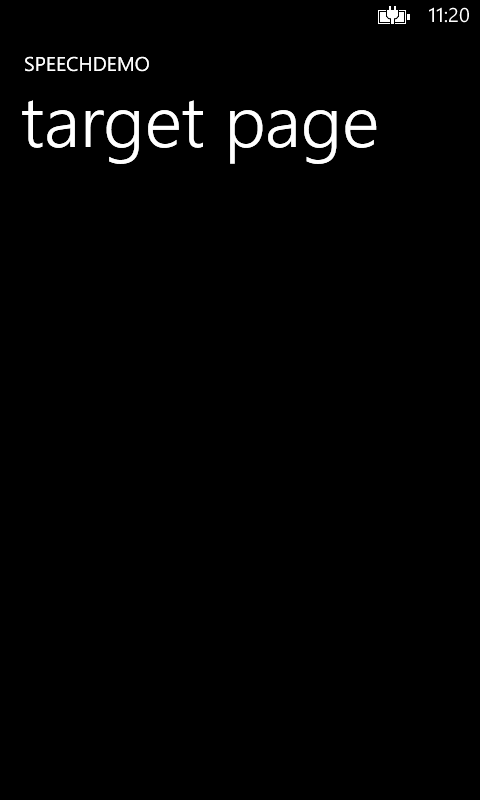 The value in the example tag will be displayed by the help for this app as an example of the commands the app supports. Next we are going to add a command that the app will act upon. First we will give our command a name. In this case “Navigate”. Then we will provide an example for this command. “navigate to target”. This will be displayed to the user by the phone as help. “SpeechDemo navigate to target” –> Here the “and” would sound weird. “Start SpeechDemo and navigate to target” –> Without the “and” the user would feel that the command sounded weird. Then we will provide feedback. 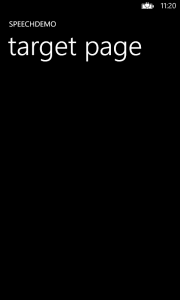 This is what the phone will read back to the user and write on the screen. Navigate is where you can, if you want, specify where the app should navigate when it receives the command. Here we insert our previously added page, “Target”. If you don’t specify a target you will land on your main page where you parse the incomming command and take action in code. This will install the file. Note that the VCD-file can loaded from any URI and not only from the app and that it can be changed by the app when it is running. Now we can start the app for the for the first time and then begin sending voice commands. Start the app and then press and hold the Windows key and say; “SpeechDemo navigate to target”. The app will give feedback and then navigate to the target page in the app. If you wish to inspect the translated query-string for the command this can be done in the “OnNavigatedTo”-method. This is useful when you need to see what phrase that was used or if you wish to have all the commands on one page without navigating away. We are gonna use our command “ShowMessage” from before to show how this can be done. 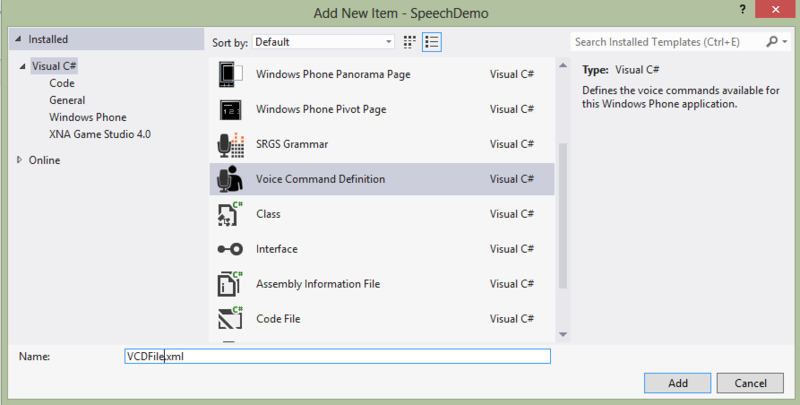 Insert the following code in the MainPage.xaml and try the saying “SpeechDemo show message one”. Now you have everything you need to create cool apps with voice commands! 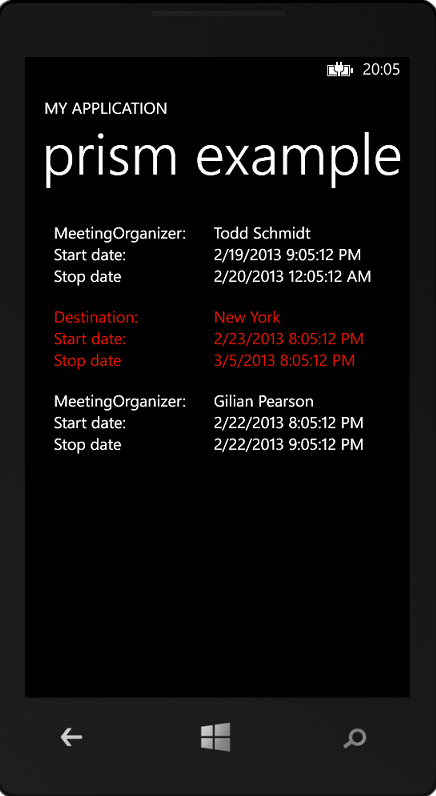 This entry was posted in C#, Windows Phone on March 5, 2013 by Johan. Quite often you would like to have a Collection in your view model that supports multiple types that derives from the same base type. Along with the different subclasses, you might want different data templates in your view, one for each type. Microsoft Prism can help you do this in an easy way and automatically select correct template for each type. This post will show how to do it on Windows Phone and you can also download the source code for the demo project (Windows Phone 7.1 for compatability) at the bottom of the page. 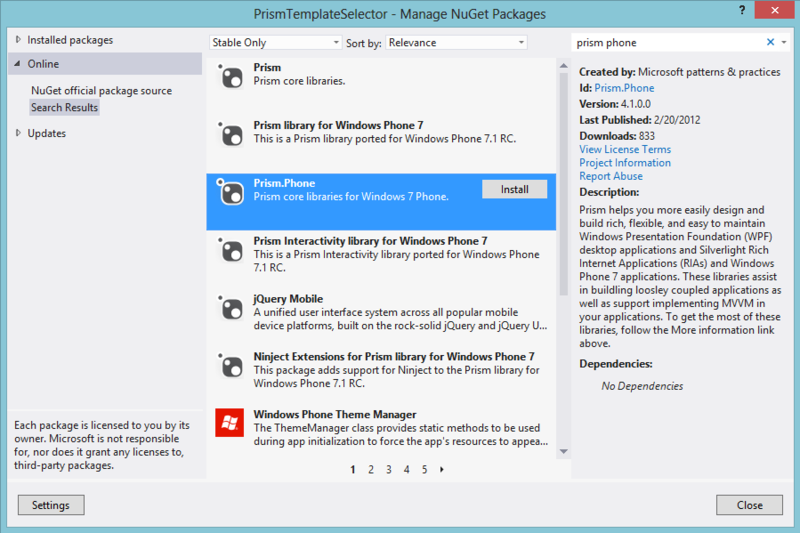 First of all, use Nuget to install Prism Phone to your project. Now, lets play with an example where we want to present a Schedule that contains meetings and trips. This gives us a solution that looks like this. Now we will add some code to our view model to add some demo data for our view. Now when that is all set up, lets look at the magic in our xaml. 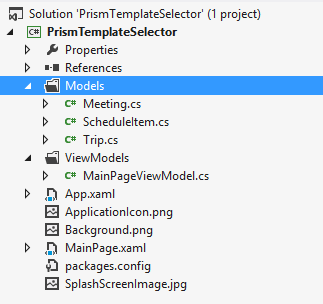 First of all we will add namespace for Prism into our xaml-view. After this we will start to write our data template and add them to our resources on the page. Note that the DataTemplate x:key shall be the name of the type you wish to bind to the template. So finally we will tie Everything together and apply the templateselector to our listbox. This entry was posted in C#, Windows Phone, XAML on February 19, 2013 by Johan. Do you want to get started developing for Windows 8, or is just curious about the what will come? Did you miss the opportunity to go to Windows 8 Development Camps? 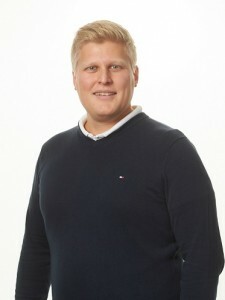 This entry was posted in C#, HTML/JS/CSS, Windows 8, XAML on May 21, 2012 by Johan. 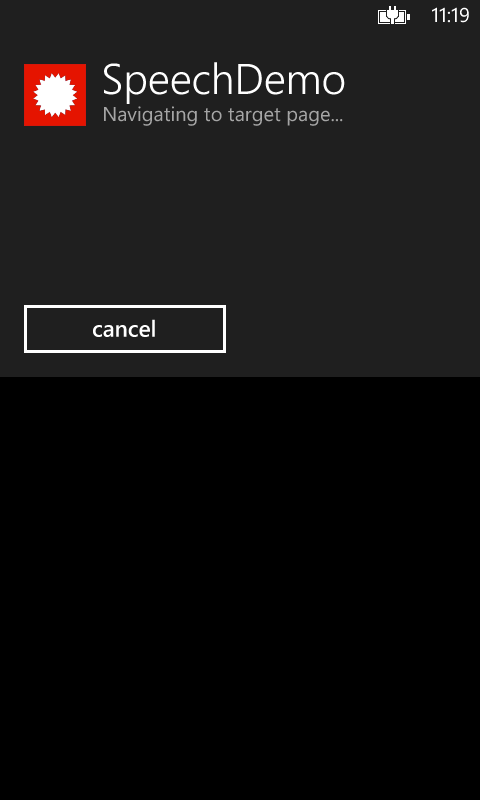 When creating a Metro-app for Windows 8, you as a developer can choose to use a light or dark theme for the application. For those of you that have previously developed for Windows Phone 7, this is nothing new. The theme is predefined and when you are using Dark (which is default by the way), the background will be dark and text and so on will be set to light colors. When using the Light theme it is the other way around. You can of course customize everything. So how do you change from Dark to Light theme for the app? Here follows one simple example of how to do this. //The following line changes the theme for the application. Use ApplicationTheme.Dark for dark theme. This entry was posted in C#, Windows 8 on March 27, 2012 by Johan.